Chocolate Mudcake decorated with fondant. There is light on the little skulls. 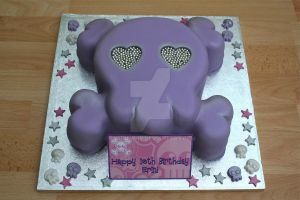 Astonishing Are the skulls cake covered in icing, or purely crafted icing? Wow... I would love my wedding cake to look somewhat like this! FINALLY something unique! Why my monitor doesn't taste like cake? I wanna lick the picture! is that for Day of the Dead? It looks amaizing, love the roses~! I don't think I've seen such a spooky looking wedding cake. Most wedding cakes are covered in fondant wich is basically cadburry egg filling with a firmer consistancy. beautiful....or...beauti-skull!!!! wonka wonka!! love this cake!! Lovely cake~! It looks so devilishly yummy. Omg, I wut love to get one of those xD, just love it! it would be a great cake for the day of the dead!! That's absolutely amazing, as always! I'd probably want to have such a cake at my wedding, if I ever got married!